The Bermagui Surf Life Saving Club is located on the grassed area next to the beautiful Horseshoe Bay Beach. The clubhouse has spectacular views across Horseshoe Bay to Camel Rock and Gulaga Mountain, and up the coastline to Montague Island. 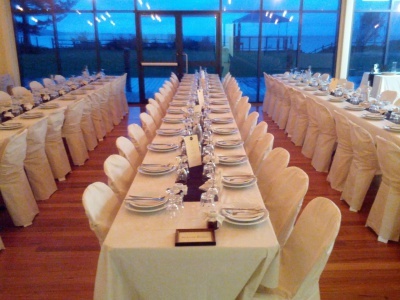 The clubhouse is directly opposite the main street of Bermagui, a spectacular and convenient location for your wedding or catered function with numerous accommodation options located within walking distance. The Surf Club is a blank canvas, lending itself to decoration for wedding receptions, special occasions, fundraising events, conferences, and many other uses. The main hall is a large auditorium with floor to ceiling windows overlooking the bay, high ceilings and a beautiful timber floor. It seats 120 people comfortably, with a smaller room to the side which is a great dancing space if you utilise the entire main hall for seating. For smaller seated functions of 60-90, you will be able to fit a dance floor in the main room but both rooms are included in the hire. Hire of the room includes the use of the tables, chairs, kitchen, crockery, glasses & cutlery. The club has enough for 150 seated guests, plus an additional 50+ chairs (if you want to use them for the outdoor area as well, or for a ceremony external to the club). There are a number of taller bar tables available for your use, for outside on the deck area, or scattered around the interior. Table cloths to fit our tables are available for your use if required, however a cleaning fee applies. The hall also works quite well for cocktail style functions, and leaves you ample room for creative decoration to fill the space. The kitchen is a commercial style kitchen, with a large gas oven and stovetop, commercial under-bench dishwasher, double fridge, etc. The facilities are suitable to catering for large functions. You may use the caterer of your choice, or self-cater, if that is your preference. Most of the local caterers are already familiar with the surf club kitchen, but we are happy to provide more information about what is included, available in the kitchen, etc. upon request. The local Bermagui butchers, Zac and Trudy Needs, offer a variety of buffet packages. Contact Zac on (02) 6493 4232. The Bermagui Surf Life Saving Club holds an on-premises liquor licence. The brand-new bar facility is well stocked, with RSA trained staff on duty for your function. All proceeds from the bar go towards maintaining the clubhouse facilities and providing essential services for the community. We endeavour to keep prices affordable, with various alcohol packages and options available to suit your style and budget. Talk to the functions co-ordinator for more information. The surf club does not provide deoorations or offer services decorating the club-house, aside from availability of tablecloths. Whilst chairs, tables and tablecloths are available for use as part of your hire, all decoration is the responsibility of the hirer of the hall. The majority of wedding couples have used local wedding decorators Bella Wedding & Event Hire for things such as chair covers, ceiling drapery, lighting, table decorations, etc (contact Tanya at 0415 309 456 for more information). They have various packages to suit a range of budgets and brides so far have been very impressed with their value for money. We have a variety of different accommodation options in town and our functions co-ordinator can give you more details when enquiring about the venue. A good place to start is Seaview Beach Houses on Lamont Street at (02) 6493-3444. We have an information sheet for those planning a function, providing more details on local caterers, churches, celebrants, florists, photographers, equipment hire (such as cool-rooms, etc), DJs, bands, cake decoration, etc. Request one from our functions co-ordinator when enquiring about the venue.